For the Bank of England, the latest jobs report will be a welcome positive amid an otherwise bleak economic story. 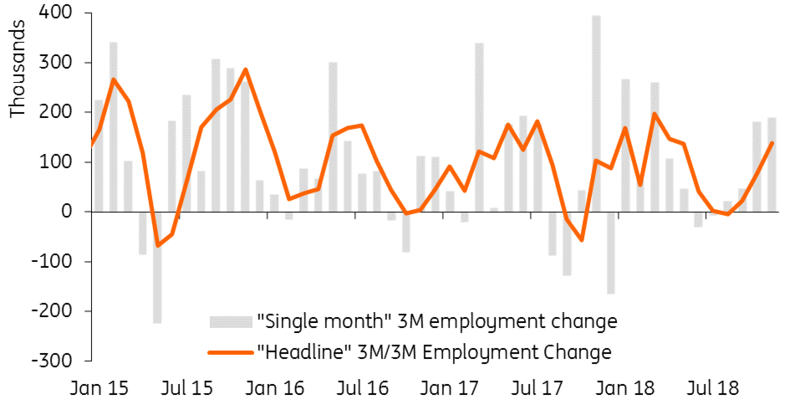 Having been virtually flat over the course of last summer, employment growth has shown greater momentum over the past couple of months. The number of people in work rose by 141,000 over the September-November period, relative to the previous three months. Secondly – and more importantly for policymakers – regular pay growth matched last month’s post-crisis high of 3.3%. This again emphasises that firms are having to lift wages increasingly rapidly to retain and attract talent. Our recent analysis indicates that this story is most noticeable in the construction, IT and hospitality sectors, all of which are reporting high skill shortage vacancy rates. In principle, the fact that real wage growth is rising more rapidly, coupled with the resilient employment backdrop, should act as a greater tailwind for consumer spending in 2019. However there are a couple of reasons to believe this won’t immediately be the case. While the perceived risk of a ‘no deal’ Brexit amongst investors appears to have fallen, businesses still have to work on the basis that an exit on WTO terms remains the default option on 29 March. This means that we are likely to hear further signs of contingency plans being enacted until there is greater clarity on the Brexit timeline, and there’s a risk that this gradually begins to slip into the consumer mindset. At the very least, individuals are likely to retain a relatively cautious attitude towards spending over the next couple of months, and in some cases may opt to boost precautionary savings levels in the short-term. There is, of course, plenty of uncertainty surrounding all of this, but one way or another we expect the economy to have a turbulent ride over the next couple of months. For this reason, we think the chances of Bank of England tightening in the first half of this year are fading rapidly. UK core inflation rises, but how long will it last?